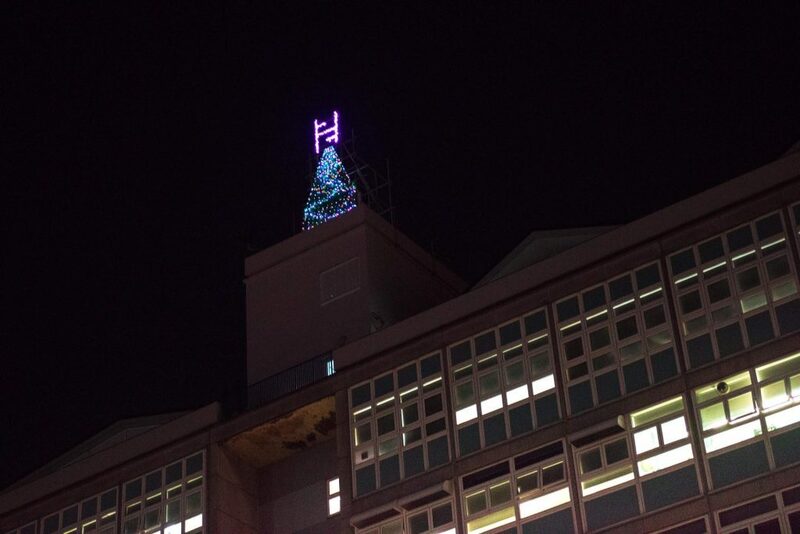 A Christmas tree installed on the top of Hull College’s tower block building could be the highest in the city. It was made as part of a collaboration between the college’s Level 1 and Level 2 electrical installation students and external scaffolding contractor Bambu, which worked as a partner and sponsor of the project. Bambu worked with the Directorate of Engineering, Construction and the Built Environment to install a scaffold structure to form the base and outline of the college Christmas tree. The tree is designed and made from scaffolding poles and measures 6.75m high by 4m wide at the base. The lighting on the tree is made from netting which has been prepared by the students and strung with 500 white LED lights suspended over the frame. The purple Hull College Group logo then sits at the peak of the tree, illuminated by 200 purple LED lights. The project has provided students with an understanding of project management, offering significant opportunities to express their design skills. This was balanced with an understanding that real objectives, involving resource and programme management, were key to successful delivery of the project. Following the success of this project, Bambu are also expected to work with the college in the New Year to scope options for further curriculum development to underpin the engineering and construction sectors. Be the first to comment on "The highest Christmas tree in the city"